Discription:Haven't got time to faff around making an authentic biryani? Try this ultra fast method for an Indian dish of beef and rice. Cook 150g basmati rice in boiling, lightly salted water for 10-12 minutes, until al dente. Drain well and tip into a large bowl. 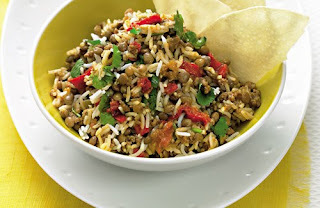 Add 410g can lentils, drained, and a good handful chopped fresh coriander. Gently mix together and season to taste. Meanwhile, heat a large, deep frying pan over a high heat. When hot, add a 500g pack minced beef and cook for 5 minutes, stirring, until browned. Stir in a 425g jar balti curry sauce, then quarter-fill the jar with water and rinse out into the pan. Add the rice mixture and gently mix everything together. Divide between plates and serve with mango chutney and poppadoms, if you like.